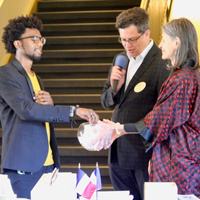 Webster University hosted 92 French language students from high schools across the St. Louis region for the Centre Francophone's annual French essay contest. The contest is open to students from any local high school who are in the second, third, fourth and fifth years of French language study. 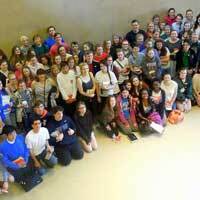 The Centre francophone presents "Pardon my French!" 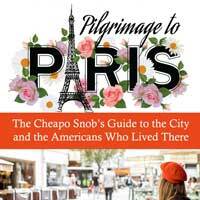 a one-woman show by Renée-Claude Thériault on April 29 at 3 p.m. in the Winifred Moore Auditorium. The French-Canadian comedian will present her hilarious new play about her culture ‘chok’ in the United States. 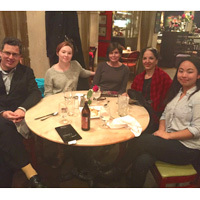 Warren Rosenblum was awarded a fellowship at the U.S. Holocaust Museum and Memorial. 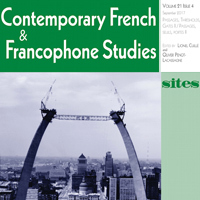 Lionel Cuille presented at an International French Studies colloquium. Kim McGrath presented "Women in Leadership: How to Prepare for Difficult Conversations" at the Forum on Education Abroad. Menbere Workie is publishing a monthly commentary on economics and finance. Zlatko Cosic's newest film, "Even The Birds Know It," will screen at a festival in Gdańsk, Poland. 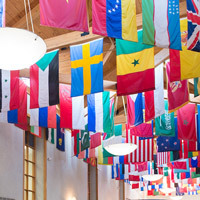 Webster University’s Centre Francophone and Vista Higher Learning will host a forum on Reimagining French Instruction for the 21st Century on March 4, from 8:30-11 a.m., in the EAB. 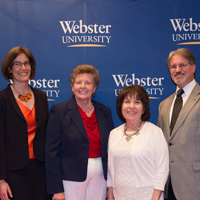 This event is hosted by Lionel Cuillé, the Jane and Bruce Robert endowed professor of French at Webster University. Centre Francophone invites members of the Webster community to a talk (in English) by Franco-Algerian filmmaker Rabah Ameur-Zaïmeche on Nov. 7 at noon in the East Academic Building, room 252. Ameur-Zaïmeche will discuss his new film, "Story of Judas," which is being presented at the St. Louis International Film Festival. Professor Lionel Cuillé will moderate the discussion. 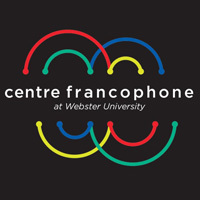 For the fourth year in a row, the Centre Francophone at Webster University hosted the French Essay Contest of the Alliance Française ("Concours de rédaction") on Saturday, April 16, in the East Academic Building. Lionel Cuillé welcomed 113 students from nine St. Louis area high schools to discuss the importance of pursuing a minor or a major in French. 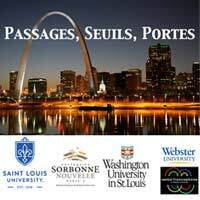 Lionel Cuillé, the Jane and Bruce Robert Chair in French and Francophone Studies, is the lead organizer for Passages, Seuils, Portes, the annual international conference in French and Francophone Studies, to be held March 17-19 at the Hilton St. Louis at the Ballpark. Three hundred scholars and speakers from around the world are scheduled to attend. This year marks the first time for the event in St. Louis. The Centre Francophone, in partnership with the Cultural Services of the French Embassy, hosted the conference, "Iran-U.S. Relations: Impact for Human Rights," with guest speaker Fariba Hachtroudi, who discussed the importance of Francophonie culture in Iran and her personal experience traveling clandestinely to Iran. 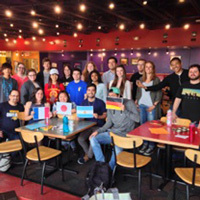 The event drew Webster students from International Languages and Cultures as well as the International Relations and International Human Rights programs. Pernille Eskerod was a lead author and guest editor in "Project Stakeholder Management," Lionel Cuille sill speak on the Charlie Hebdo affair at the University of Arizona, Warren Rosenblum’s article, “Serene Justitia and the Passions of the Public Sphere,” appeared in the the InterDisciplines Journal of History and Sociology, and Scott Kilgallon was named to the NCAA Division III Convention-Planning Subcommittee.